Pictured L-R: Maureen Droney, P&E Wing Managing Director; and honoree Nile Rodgers, at the 57th GRAMMY® Awards P&E Wing Event at Village Studios on February 3, 2015, in Los Angeles, California. Photo by Maury Phillips. Photo Courtesy of The Recording Academy® / WireImage.com © 2015. 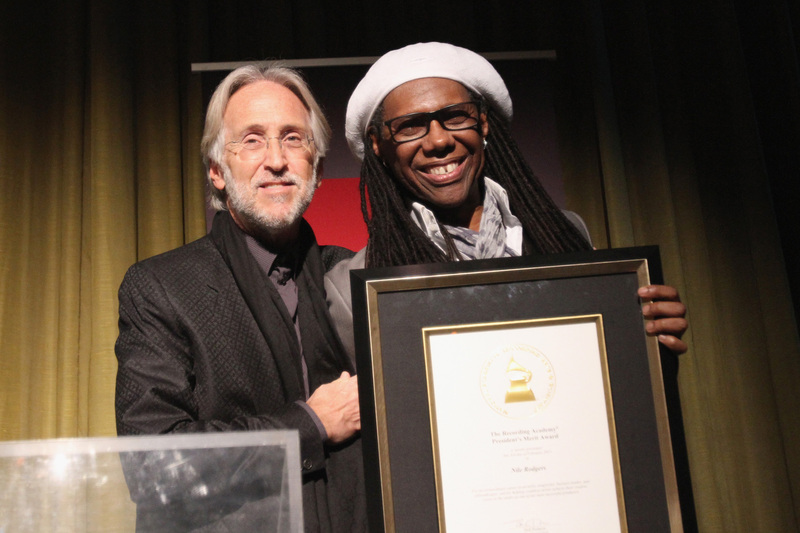 Pictured L-R: Neil Portnow, President, The Recording Academy®; and honoree Nile Rodgers, with the President's Merit Award, at the 57th GRAMMY® Awards P&E Wing Event at Village Studios on February 3, 2015, in Los Angeles, California. Photo by Maury Phillips. Photo Courtesy of The Recording Academy® / WireImage.com © 2015. 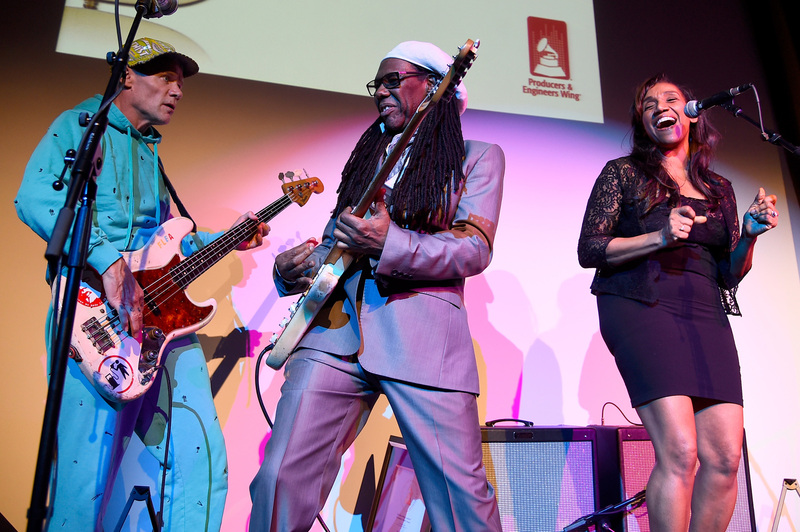 Pictured L-R: Bassist Flea; honoree Nile Rodgers; and Kathy Sledge, performing at the 57th GRAMMY® Awards P&E Wing Event at Village Studios on February 3, 2015, in Los Angeles, California. Photo by Maury Phillips. Photo Courtesy of The Recording Academy® / WireImage.com © 2015. Key personnel from sponsors of the 57th GRAMMY® Awards P&E Wing Event Honoring Nile Rodgers at Village Studios on February 3, 2015, in Los Angeles, California. Photo by Maury Phillips. Photo Courtesy of The Recording Academy® / WireImage.com © 2015. Santa Monica, Calif. (Feb. 20, 2015) — Reprising once again what has become a highly anticipated celebration that marks the official start of GRAMMY® Week, The Recording Academy® Producers & Engineers Wing®'s eighth annual event was held Tuesday, Feb. 3, at the Village Studios in West Los Angeles. The event is focused on the irreplaceable contributions made by recording, mixing and mastering engineers and record producers whose technical expertise and creative brilliance earn these professionals working behind the glass GRAMMY Awards and nominations of their own. The annual gathering was created specifically to honor individuals who strive for audio excellence and, as described by Recording Academy President/CEO Neil Portnow, those who have "championed creative freedom" throughout their career, The event is, as expressed by Village Studios CEO Jeff Greenberg, "A celebration of those of us who show up every day in these studios and make the music." Contributing to the festive environment of the evening, musical selections were provided by DJs Mr. Pauer and DJ Cassidy, who kept the evening's dance theme on track with a high note. The event preceded the 57th Annual GRAMMY Awards, which took place on Sunday, Feb. 8, 2015, and aired live on the CBS Television Network. The signature event also featured the presentation of The Recording Academy President's Merit Award. Previous honorees at this event have been Chris Blackwell; T Bone Burnett; Tom Dowd; Ahmet and Nesuhi Ertegun; Jimmy Iovine; Quincy Jones; Arif Mardin; Al Schmitt; Jerry Wexler; and Neil Young. This year's honoree, Nile Rodgers, was presented with the award by Portnow in a special ceremony held in the ballroom of the Village Studios. Rodgers received the award to the applause of hundreds of Academy and P&E Wing members and guests. Rodgers first came to prominence with Chic, the band he founded in 1976 with bassist Bernard Edwards. As a producer, Rodgers guided classic recordings with artists including Sister Sledge, Diana Ross, Duran Duran, INXS, Madonna and David Bowie, for whom Rodgers produced the artist's biggest selling album Let's Dance. Rodgers has remained vital to great recordings, as both a producer and a musician. Another highlight of Rodgers' career is his philanthropic venture, the We Are Family Foundation, dedicated to creating and supporting programs that inspire and educate the next generation. Also celebrated that evening was the progress that The Recording Academy has been achieving in Washington, D.C., with substantial support from P&E Wing members. DarylP.Friedman, Chief Advocacy & Industry Relations Officer forThe Recording Academy, announced proposed legislation backed by digital royalties collection agency Sound Exchange that would create new mechanisms to ensure equitable compensation for record producers and engineers." You should be paid and paid fairly," Friedman stated, to the applause of the crowd. Another star of the evening was the legendary Village Studios, home to numerous classic and GRAMMY Award-winning recordings, including Fleetwood Mac's Tusk and the soundtrack to O Brother, Where Art Thou?. Guests included six-time GRAMMY winner Flea, singer/songwriter and producer Ric Ocasek, GRAMMY winner Diane Warren, percussionist Sheila E., singers Aloe Blacc and Kathy Sledge, GRAMMY winner Slash, three-time GRAMMY winner "Weird Al" Yankovic, Recording Academy Chair Christine Albert, saxophonist and L.A. Chapter President Mindi Abair and many others. Title sponsors included AVID, BMI, DTS, ELS Studio Premium Audio® – Powered by Panasonic, HARMAN Professional brands AKG®, dbx®, JBL® Professional and Lexicon®, Iron Mountain Entertainment Services, Louisiana Entertainment, Music Marketing, PMC Ltd. and Shure. Participating sponsors currently include Astell & Kern, Audeze, the Audio Engineering Society (AES), Audio-Technica, Capital Bauer Insurance, Guitar Center Professional, iZotope, Native Instruments, Prism Sound, Recording Connection Audio Institute, Lurssen Mastering, SoundExchange, and Westlake Pro. "This annual event is a highlight in the P&E Wing's yearly itinerary and also provides our community the acknowledgment it so deserves, especially during GRAMMY Week," said Maureen Droney, P&E Wing Managing Director. "It is a celebration of all the creative accomplishments that members of the Wing achieve day in and day out, in the studio and everywhere that music is made." Photo Caption 1: Pictured L-R: Maureen Droney, P&E Wing Managing Director; and honoree Nile Rodgers, at the 57th GRAMMY® Awards P&E Wing Event at Village Studios on February 3, 2015, in Los Angeles, California. Photo by Maury Phillips. Photo Courtesy of The Recording Academy® / WireImage.com © 2015. Photo Caption 2: Pictured L-R: Neil Portnow, President, The Recording Academy®; and honoree Nile Rodgers, with the President's Merit Award, at the 57th GRAMMY® Awards P&E Wing Event at Village Studios on February 3, 2015, in Los Angeles, California. Photo by Maury Phillips. Photo Courtesy of The Recording Academy® / WireImage.com © 2015. Photo Caption 3: Pictured L-R: Bassist Flea; honoree Nile Rodgers; and Kathy Sledge, performing at the 57th GRAMMY® Awards P&E Wing Event at Village Studios on February 3, 2015, in Los Angeles, California. Photo by Maury Phillips. Photo Courtesy of The Recording Academy® / WireImage.com © 2015. Photo Caption 4: Key personnel from sponsors of the 57th GRAMMY® Awards P&E Wing Event Honoring Nile Rodgers at Village Studios on February 3, 2015, in Los Angeles, California. Photo by Maury Phillips. Photo Courtesy of The Recording Academy® / WireImage.com © 2015. About The Recording Academy: Established in 1957, The Recording Academy is an organization of musicians, songwriters, producers, engineers and recording professionals that is dedicated to improving the cultural condition and quality of life for music and its makers. Internationally known for the GRAMMY Awards — the preeminent peer-recognized award for musical excellence and the most credible brand in music — The Recording Academy is responsible for groundbreaking professional development, cultural enrichment, advocacy, education and human services programs. The Academy continues to focus on its mission of recognizing musical excellence, advocating for the well-being of music makers and ensuring music remains an indelible part of our culture. For more information about The Academy, please visit www.grammy.com. For breaking news and exclusive content, follow @TheGRAMMYs on Twitter, like "The GRAMMYs" on Facebook, and join The GRAMMYs' social communities on Google +, Instagram, Pinterest, Tumblr, and YouTube.